There’s no need to go to Starbucks to get your PSL fix this fall! Making your own at home is healthier and tastes so much better. Serve this homemade coffee drink iced or hot and enjoy! What should you do? Flex your amateur barista muscles and make a Starbucks-worthy pumpkin spice latte recipe at home. Now you can enjoy a healthier and tastier PSL whenever you want–for way less money. No one can call you basic when you can make a PSL yourself!! This recipe takes eight simple ingredients, many of which you’ll have in your cupboard or fridge. No artificial flavors or colors in sight! This homemade pumpkin spice latte contains just 302 calories, not including the whipped cream garnish. Even though it’s a little higher in calories than the Starbucks version, our recipe is made with high quality, all-natural ingredients and doesn’t compromise on taste. Measure out the eight ingredients: pumpkin puree, pumpkin pie spice, black pepper, vanilla, brown sugar, milk, cream, and coffee. Put the puree, pie spice, pepper, and brown sugar in a small saucepan over medium heat. Cook for about 2 minutes on medium heat until it begins to bubble and smells spicy. Stir in the vanilla extract, then put the pumpkin mixture into a bowl. Pour the milk and cream into the same saucepan and heat until simmering. Add the pumpkin mixture and whisk until smooth. Blend the pumpkin milk in a blender for at least 60 seconds on high speed until very well mixed and foamy. Pour 1/2 cup of coffee into a glass. Pour 2/3 cup of pumpkin milk on top and gently stir to combine. Sprinkle on some pumpkin pie spice and enjoy! Don’t skip the cooking. Briefly cooking the pumpkin puree with spices brings out the flavor and aroma. Blend the pumpkin milk thoroughly. This step adds foam to the milk and prevents settling or separation of the latte. Use freshly brewed coffee or espresso. The bitter taste of old coffee won’t improve the latte. Make the pumpkin milk ahead of time. It will keep in the fridge for a few days–just re-blend it before using. Turn it into an iced pumpkin spice latte in one step. Pour your freshly made latte over crushed ice and enjoy! Pumpkin Pie Spice: just blend together ground ginger, cinnamon, nutmeg, and allspice. Grab the recipe here. Pumpkin Puree: replace the 3 tablespoons pumpkin puree with 1 1/2 tablespoons of pumpkin spice syrup. Milk/Cream: use almond milk instead of whole milk and coconut cream instead of heavy cream. Make a Starbucks-quality PSL at home with these other recipes. 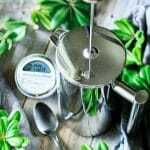 How to Make French Press Coffee: these tips will help you make some of the best coffee you’ve ever had. How to Make Whipped Cream: ditch the canned stuff and make your own with this easy recipe. Pumpkin Pie Spice: this simple blend of four spices will make your PSL amazing. Share your thoughts on this Starbucks pumpkin spice latte recipe in the comments below. We’d love to hear what you think! Place the pumpkin puree, brown sugar, pumpkin pie spice, and black pepper in a small saucepan. Stir continuously over medium heat for about 2-3 minutes, until the puree begins to bubble and sizzle and smells spicy. Mix in the vanilla extract, then spoon the mixture into a small bowl. Pour the milk and heavy whipping cream into the same saucepan and set over medium heat. Stir it occasionally. When it begins to steam, add the pumpkin puree concentrate and whisk continuously until well blended and smooth. Pour the pumpkin milk into a blender and blend for at least 60 seconds on high speed. Pour 1/2 cup of coffee and 2/3 cup of pumpkin milk into a glass or mug to make one latte. Gently stir to combine. Serve warm, cold, or iced. Pour 1/2 cup of heavy whipping cream and 2 teaspoons granulated sugar into a small mixing bowl and beat until stiff peaks form. Pipe or spoon the whipped cream on top of the latte, then sprinkle a little pumpkin pie spice over it. Serve immediately. Make this an iced pumpkin spice latte by pouring the latte over crushed ice. The pumpkin milk will keep in the fridge for a few days. If you’re in a hurry or counting calories, skip the whipped cream garnish. This post was originally published in October 2017 and updated in September 2018.